Littlest Voices | "Global Possibilities"
Suddenly, after weeks of seeding and planting, variable weather conditions and endless planning, the season is underway at Katchkie Farm. This past week has been the season’s opener with the first group of young NYC visitors to The Sylvia Center garden coupled with the arrival of our new piggies (Ossabaw Island Hogs) and the annual Spring Planting Sunday. 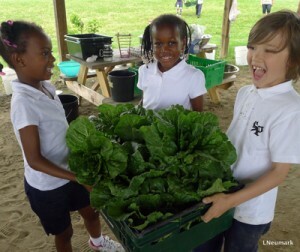 A Columbia County NOFA-certified organic farm that has crops that end up in hundreds of exclusive CSA bags around Manhattan and in the meals of restaurant diners throughout the city, Katchkie is also home to a program that connects school children to the joys and flavors of healthy, delicious local food. It is a dual-mission farm, growing for privileged eaters and for those most at risk from diet related disease. That is the role of The Sylvia Center and its passionate educators. The first visitors were first graders from PS 180, located at Manhattan Avenue and 120th Street. They poured off the bus with exuberance, eager to explore, run, touch, taste and smell. Soon, they split in two groups: One headed to the garden (especially designed for small feet and curious hands), and the other to the open air field house to start the meal preparations with the cracking and whisking of dozens of freshly laid eggs. Oh yes, they gathered the eggs as well! They were fearless and cracking eggs is endless fun, except for the yucky feeling of slimy fingers. The meal of the day was brown rice with vegetables mixed with scrambled eggs — a healthy interpretation of veggie fried rice. The vegetables included spring onions, garlic scapes and bok choi — all growing at the farm and harvested right before cooking. A hearty green salad with edible blossoms rounded out the meal, along with a homemade rhubarb-ade, a seasonal thirst-quencher. In the garden, serious planting of potatoes provided unexpected and squeamish interaction with bug life. For some kids, bugs are fascinating, while others freak out, though usually with a smile. The chamomile flowers were particularly fragrant this week and ended up in pockets as souvenirs for home and family along with an herb or a small stone. The group prepared the entire meal and it was an opportunity to demonstrate knife skills (with the bear-claw technique), whisking, chopping, measuring (yes, that is math) and above all else, community. They were amazingly eager to cook together, bragging about their skills or equating themselves with a famous chef they have watched on TV. Some talked about cooking at home. Their passion transfered directly to lunch where over conversation, it is thrilling to watch the meal devoured. And then it was time to head home, recipes in tow to share with caregivers and families. A volunteer community arrived on Spring Planting Day to continue work in the children’s garden — local Columbia County neighbors, CSA members, farm aficionados. Planting includes dozen of sunflowers, herbs, young veggies — followed by weeding and watering, which proved not necessary as a brief storm blows through from the neighboring Catskill region. We discovered a bird has built its nest in a mound of hay that surrounds plantings in the Children’s Garden. How appropriate to raise one’s young in a spot that celebrates nurturing — yet how vulnerable to feet not to mention marauding animals! After the pounding storm, we wondered if the ground level nest survived, its babies barely two days old. It did — Mother Bird chose wisely, the nest was shielded from the winds and the hay mound let the rainwater drain safely below nest level. We peeked in to see open mouths looking for food. That is the story of our garden and our lives — open mouths (and minds) looking for something sustaining to eat. Our kids trust us to feed them well, with ingredients that will make them strong, smart and healthy. It takes a garden aligned with Mother Nature and basic good principles to provide simple foods, lovingly prepared and joyfully served. It is a mission we champion in the half-dozen NYCHA sites where The Sylvia Center runs its programs, in our support for school gardens and in the fight to reform school lunches. It is our support for a Farm Bill that recognizes our obligation to feeding the hungry with dignity and quality food and supporting our Mayor as he battles for a healthier city. The littlest, most vulnerable lives are in all our hands.